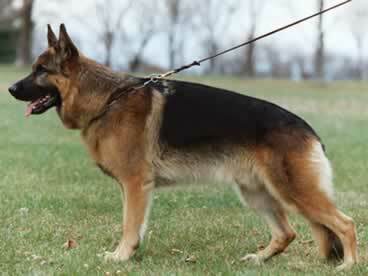 The German Shepherd Dog should have a smooth top line, beginning from the back of the neck and continuing in a straight line over a well developed wither and sloping slightly toward the croup. The tail should be bushy on the underside, and should reach at least to the hock joint. The front legs should be absolutely straight. The feet should be rounded, with the toes well closed and arched. The hindquarter bones should be rounded toward the back, and, when viewed from the back, parallel to each other.